If you are looking to relish the best Indian food in Dubai, then head straight to Antique Bazaar Restaurant in Four Points by Sheraton in the locality of Bur Dubai. Your trip to this bistro will not be less than a royal treat, as here you will get authentic and traditional Indian dishes that were once served to the royal families of India. In addition to this, the magnitude of good manners on the service makes you feel like a prince or king. It is because of these fine features, Antique Bazaar has been able to win the award of Best Indian Restaurant in United Arab Emirates after remaining a finalist for past four years. You will get both vegetarian and non vegetarian dishes on the menu of this eatery along with fish and a variety of drinks including alcohol. This royal treat will certainly revitalize you and make this Indian culinary journey an unforgettable experience. The cooking of this award winning restaurant truly reflects the authenticity of the Indian food, as the chefs of Antique Bazaar work really hard to serve dishes to their guests, which had once ruled the hearts of royal emperors of India. The menu includes veg dishes like, Dahi Samosa, Aloo Chaat/Kabuli Chaat, Vegetable Pakoras, Sheekh Subz Bahar, Paneer Tikka and Pasand ke Aloo, whereas non-veg varieties comprise of dishes like Diwan Handi Gosht, Gosht Angara or Gosht Nawabi and etc. On top of this people can bring along their families to this bistro, as it is a family friendly restaurant, where live music is also played to entertain the guests. Fine range of alcohol is also on the menu of this eating place in order to make the dining experience more memorable. Reservations can also be made in advance in this eatery, plus they also deal in organising events at this venue. To see the royal treats in the menu of Antique Bazaar, click here! This restaurant operates on all days of the week, but its operational timings vary a bit, as from Saturday to Thursday lunch is served from 12:30 pm to 3:00 pm and dinner is dished up between 7:30 pm and 3:00 am. However, on Fridays this bistro serves dinner only amid 7:30 pm and 3:00 am. Four Points Sheraton, Khalid Bin Al Waleed Road - Dubai - United Arab Emirates. 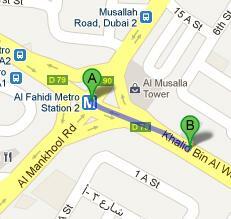 Al Fahidi Metro Station 2 can be located 230 metres away from the Antique Bazaar at Four Points by Sheraton in Bur Dubai. Pedestrians can cover this distance in about 3 minutes, if they head in the southeast direction on Kalid Bin Al Waleed Road/D 79 towards Al Mankhool Road/D 90, from this metro station in order to reach the destination located on the left side. Four Point Sheraton Hotel 1 is the nearest bus stop which is just in front of the hotel. Route numbers 21, 29, 33, 42, 44, 61, 61D, 66, 67, C3, C5, C18 and C19 serve this stop!